American Indian Sports Team Mascots © 1998 - 2019. All rights reserved. The Spanish Fork Press, July 22, 1909 "For many years there had been suspended from a smoke-stained beam...a trophy of the early days he had spent on the shore of the lake. It was an Indian's scalp." "'You ask me why I keep that thing in the house? When I first came here...I hadn't but one white man for a neighbor and he lived two miles away...But I had plenty of another kind. There were wild beasts and savages on all sides, and there were times when they both gave me lots of trouble. With the beasts I could get along pretty well...But with the redskins it was different. It wasn't no use to try and thin them out, although there was times when I had to try my hand at it...You never could tell for a certainty when they were friendly to you or when they were waiting for a good chance to take your scalp....The redskin looked as ugly as p'izen. "'White man let it alone or Injun have his scalp' he cried, as he drew his knife." 'You'll have to take it first, you thieving redskin', said I." This 1909 fictional story from Utah illustrates how the dehumanizing ethnic slur exploited by the Washington, D.C., NFL team was used in popular culture, the legacy of which continues to this day. Besides being a form of symbolic slavery that allows users to define, exploit, and manipulate concepts about both historic and living Native Peoples, the institutionalized use of stereotypical "Indian" sports team tokens may also be thought to serve as symbolic war trophies. Inter-Tribal mascot resolution by the Seminole, Cherokee, Choctaw, Chickasaw, and Muskogee Nations "representing over 400,000 people throughout the United States"
National Indian Education Association resolution calling "for the immediate elimination of race-based Indian logos, mascots, and names from educational institutions throughout the Nation." "There is today no single word more offensive to Indian people then the term "redskins," a racial epithet..." Vine Deloria Jr.
"Offensive Slang: Used as a disparaging term for a Native American"
"dated: offensive an American Indian"
Slang: "Often Disparaging and Offensive"
"An American Indian: now considered by many to be an offensive term"
"Offensive Slang: "Used as a disparaging term for a Native American"
Team's first owner, George Preston Marshall, was an avowed racist and proud segregationist whose choice of team name has earned him the label of "the most notable and influential racist in NFL history." "What is needed down there is some wholesome discipline for rampant redskins. The proportion of flour, bacon and blankets issued to them is out of the proportion to the metallic cartridges administered in the way that would do them the most good." * 59% Agreed that if referred to as a "redsk*n" a Native American person has the right to feel offended. * 55% Stated that as a fan it would not make any difference to them if the Washington NFL team changed its name. * 58% Stated they would feel comfortable if the Washington NFL team changed its name. In a 2001 survey by Indian Country Today, 81 percent of respondents indicated use of American Indian names, symbols and mascots are predominantly offensive and deeply disparaging to Native Americans. "28 schools in 18 states were once the Redskins, but now currently use another mascot. Capital News Service fact‒checked data and found that the Washington Redskins had overstated the number of schools using the name." So-called "good" intentions or "context" do not matter one bit when the final outcomes arising from the institutionalized, race-related practices you clearly endorse and promote have negative impacts on real, living American Indian people, especially children, adolescents and teens. It is one thing to claim innocent ignorance concerning such things. It is quite another to continue the practices after having been told for years by many highly respected American Indian, civil rights, religious, and education organizations about the problems such actions, and by extension, you now personally cause. The damaging practices have therefore become willful on your part and no amount of denials, public relations gimmicks, cherry picking, high-priced lawyers or slick rationalizations can change that. Such tangible actions speak much louder than hollow, even if genuinely well-meaning words about "tradition" and "showing respect." How can you be "honoring" someone when they are telling you that what you're doing is hurtful to them? The long overdue time has come to do the right and honorable thing. Stop stereotyping, dehumanizing, and exploiting American Indian peoples for your sports entertainment, self-inflation, and financial gain. Stop bringing shame on yourselves, your leagues, teams, schools, communities, and our nation. The embarrassment and humiliation you cause yourselves will only increase and get worse the longer you delay. Time is not your ally but rather something that works against you. Get on the right side of history. Embrace progress. Promote justice and unity. American Indian peoples past and present are not mascots for big business or fun and games. Retire your outdated, harmful, race-related practices now! For many more news articles visit the Archives Section. Click on image or follow this link to a collection of American Indian sports team mascot related cartoons. Cartoons Depicting "Indians" For more resolutions and related information visit the Educators' and More Educators' Resources sections By exploiting and fueling a divisive controversy that Dartmouth College willfully helped to create, The Dartmouth Review featured the above image and headline in its 11/28/06 edition. "...[M]ascot came into English as a borrowing of the French word mascotte, meaning ‘mascot, charm.’ The English word is first recorded in 1881 shortly after the French word, itself first recorded in 1867, was popularized by the opera La Mascotte, performed in December 1880. The French word in turn came from the Modern Provençal word mascoto, ‘piece of witchcraft, charm, amulet,’ a feminine diminutive of masco, ‘witch.’ This word can probably be traced back to Late Latin masca, ‘witch, specter.’ ...."
"I am not a sports team mascot. With all due respect to the teams who want to honor me by having a Native American mascot, it's outdated. It's the wrong way." "We simply chose an Indian as the emblem. We could have just as easily chosen any uncivilized animal." "We don't view it as looking down on the race...We're not trying to make light of anyone or certainly not ridiculing anyone." Athletic director at Coshocton H.S., Coshocton, Ohio (2003) which uses an "Indian head" doormat to compliment its ethnic slur nickname. In a survey by Indian Country Today, 81 percent of respondents indicated use of American Indian names, symbols and mascots are predominantly offensive and deeply disparaging to Native Americans. "The ridicule, mockery and utter racism Native Americans are subject to because of the use of Indian mascots are intolerable." "The high school's mascot is a student dressed in a buckskin outfit who wears a mask with a big nose, large lips, large eyes, big cheeks and long, black hair." "If we thought it was offensive, we wouldn't do it." "People have a tendency to try to make us different. We're not. We're just like all other high school kids." Stereotypic "Indian head" icons like this one are among the most common and may be thought of as symbolic war trophies. College students perform the so-called, "tomahawk chop." This aggressive gesture, simulating the use of a weapon, originated at Florida State University and is now also seen at other public school and professional sports venues. Its purpose is to intimidate opponents and cheer on the fans' teams. The "tomahawk chop" is typically accompanied by a sing-song, Hollywood style "war chant." * According to a published news account, over the course of the school's 154 year history only 3 members of the Seminole Tribe have graduated from FSU. * About 75 percent of the Seminole live in Oklahoma. * There are actually three Seminole tribes in Florida and only one tribal government - the one which uses the name "Seminole Tribe of Florida" - has formally signed on to the use of the mascot. * The June 2005 resolution passed by the solitary Seminole Tribe of Florida regarding FSU's mascot was done so at the request of FSU President T.K. Wetherell. * Prior to getting the June 2005 Seminole tribal endorsement Florida State announced, along with a number of other incentives, the establishment of scholarships covering 80% of tuition costs for "Seminole Scholars" recruited from reservations. * The Florida State Legislature includes "'the Seminole Caucus' - an unofficial but influential group of about two dozen state lawmakers who are Florida State alumni or have ties to the school." * "And then there's the university's impact in Tallahassee. Hundreds of Florida government officials are Florida State graduates and supporters. We deal with these people every day, working with them to clean up the Everglades, to improve the roads that lead to our reservations and to support the public schools that many of our children attend." * "The NCAA position on the use of Native American mascots, names and imagery has not changed, and the NCAA remains committed to ensuring an atmosphere of respect and sensitivity for all who participate in and attend our championships." NCAA statement associated with withdrawing FSU from post-season championship ban. This photograph from the movie "Schindler's List" shows actor Ben Kingsley in the role of Itzhak Stern as he walks on gravestones used by Nazis for paving. Tomb markers from Jewish graves were broken and used as paving stones at Gestapo headquarters. Some authorities report that Hitler was strongly influenced by the manner in which American Indians had been dealt with and viewed by the U.S. government. "Embedded in the granite floor inside the main entrance to Ralph Engelstad Arena, an enormous American Indian-head logo spreads like a welcome mat in front of the larger-than-life statue of Engelstad himself." White House spokesman Scott McClellan responding to Mexico's use of the Memin Pinguin character on a postage stamp (left), June 2005. 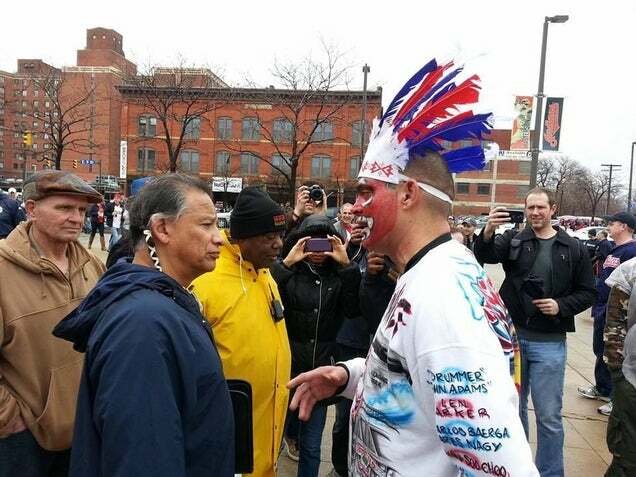 At right is the "Chief Wahoo" icon used by the Cleveland, Ohio, major league baseball team.